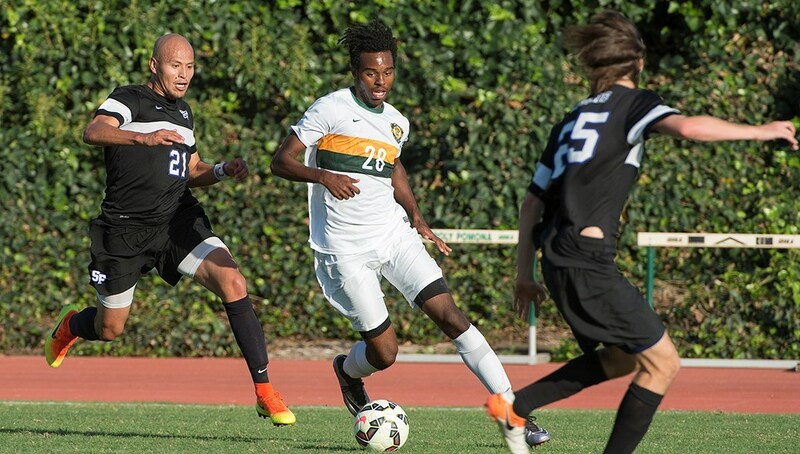 The local area will be well represented at the CCAA soccer tournament which starts Tuesday as Cal Poly Pomona and Cal State San Bernardino advanced both their men’s and women’s teams. Six teams advanced with the top two seeds getting first round byes. On the men’s side Tuesday Cal Poly Pomona (12-4-2) is the third seed and will be at home to face No. 6 Cal State Los Angeles (9-5-3) at 7 while No. 5 San Bernardino (9-5-1) will be at No. 4 Chico State (8-5-3). On the women’s side Tuesday’s games will feature No. 6 Cal State Los Angeles (6-8-3) at No. 3 San Bernardino (8-6-2) at 3 and No. 5 Cal State Stanislaus (12-6) at No. 4 Cal Poly Pomona (7-6-3) at 4:30 p.m. Defending champions are the Cal Poly Pomona men and UC San Diego women. Cal State San Bernardino senior midfielder Melanie Aguayo, a graduate of Don Lugo High School, has been named CCAA Women’s Soccer Player of the Week. She had three goals on the week, two of those coming in a 3-2 overtime win against UC San Diego. She also had the Coyotes only goal of the game in a 1-1 double overtime tie against Cal State San Marcos. She has six goals on the season to lead the CCAA in goals and points scored.